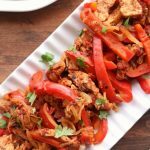 Instant Pot/Slow Cooker Pork Chop Fajitas–make amazingly flavorful fajitas (thanks to a secret ingredient) in the Instant Pot or slow cooker with pork chops. When you buy those inexpensive mega packs of pork chops use this recipe to mix up dinner and bring something new to the table (literally). For months I’ve had a can in my pantry. 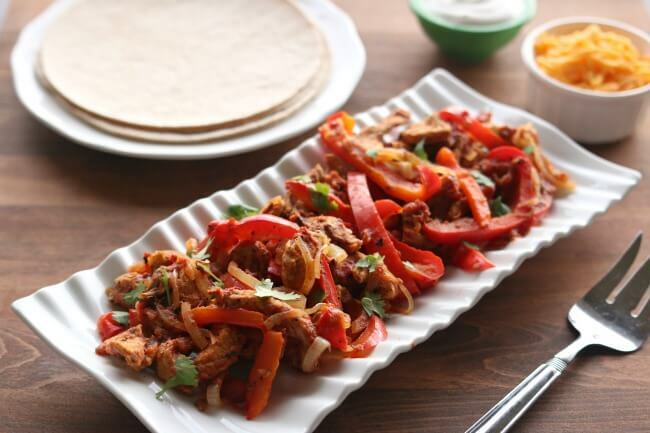 Today I finally used that can and it was a game changer for this Instant Pot/Slow Cooker Pork Chop Fajitas recipe. It gave it a ton of flavor without a lot of work (besides opening a can). Can you guess what it was? It was a can of fire roasted salsa style diced tomatoes. Boom. My can was the Great Value brand which tells me I bought it at Walmart. But after a quick google search I see there is also a Kroger version. I haven’t checked other stores but I bet you can find other brands out there too. I had about 1 1/2 pounds of “pork loin sirloin chops, thin cut” that I needed to either use up or freeze today and I wanted to try something a little different than just having pork chops for dinner. I sliced (I used my kitchen shears) the meat into thin, long pieces. And threw it in the Instant Pot along with the fire roasted tomatoes, red bell pepper, taco seasoning, onion and lime juice. The result was amazing flavored fajitas that tasted amazing rolled up in a soft flour tortilla with sour cream and grated cheddar cheese. Slow Cooker I Love: I used my 6 quart oval Kitchenaid slow cooker. I love this slow cooker (you can see me talking about it in a video here). It cooks low and evenly. I love the medium heat choice because most slow cookers that I’ve seen only have the option of cooking on low or high. If you’re going to buy just one slow cooker, this is the one that I recommend. Pressure Cooker I Love: I used my 6 quart Instant Pot Duo 60 7 in 1 for this recipe. I also own the 6 quart Instant Pot IP-LUX60 V3 Programmable Electric Pressure Cooker. They are both great pressure cookers! The first one I mentioned has a yogurt making function but other than that they are fairly similar. The price difference between the two is about $20. 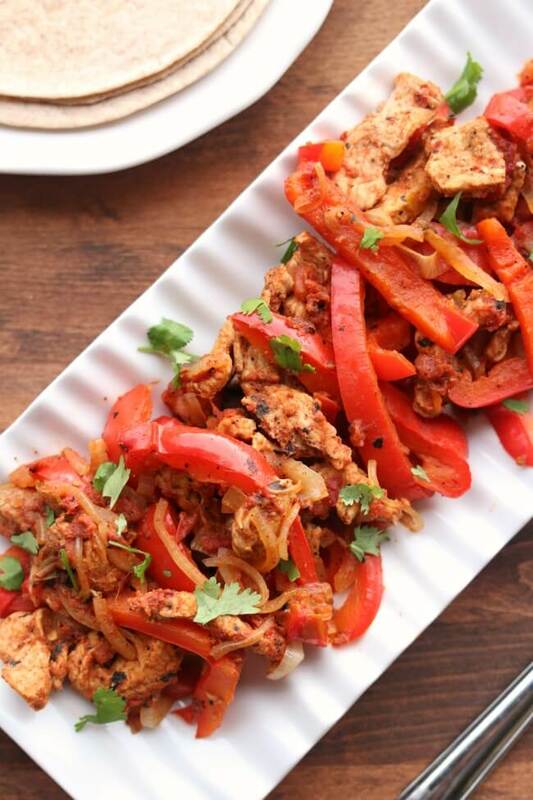 Make amazingly flavorful fajitas (thanks to a secret ingredient) in the Instant Pot or slow cooker with pork chops. When you buy those inexpensive mega packs of pork chops use this recipe to mix up dinner and bring something new to the table (literally). For serving: tortillas, grated cheddar, sour cream, guacamole, etc. Add tomatoes, bell peppers, taco seasoning, onion, lime juice and sliced pork chops to the slow cooker. Stir. Cover the slow cooker and cook on low for 2 hours. Stir again. Check meat for doneness. All slow cookers cook differently. My meat was done easily in 2 hours but it may take longer depending on your slow cooker. 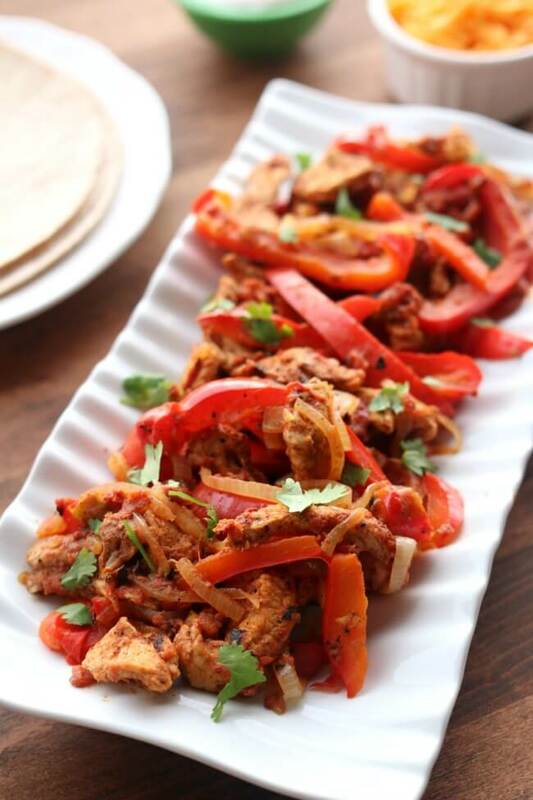 Spoon the meat and pepper mixture down the middle of a tortilla. Top with cheese, sour cream and guacamole and enjoy! Add tomatoes, peppers, taco seasoning, onion, lime juice, water/chicken broth and pork to the Instant Pot. Stir. Cover the pot and make sure valve is set to “sealing.” Set the manual pressure cook button (on high pressure) to 1 minute. When the timer beeps let the pressure release naturally for 10 minutes and then release any remaining pressure by moving the valve to “venting.” Stir. To make gluten free: Serve on corn tortillas! Be sure to get GF taco seasoning. Double check broth. This post contains affiliate links for Amazon. Can you use frozen pork in this recipe? If so, what is the cooking time? yes you can. the time will be the same! I like this kind of Mexican’s meals. This is my combination of flavours. Looks so delicious and tasty.